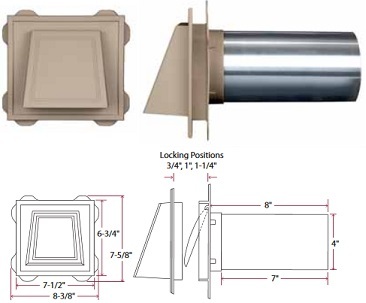 This 4" all aluminum exhaust hood features a damper that prevents cold air backdraft, snow or rain from entering the home. The low profile, all aluminum design, will not warp or crack, ensuring a long lifespan of the product. These hoods are ideal for bathroom fan venting, dryer venting and kitchen range hood venting. 4" x 8' UL dryer vent kit. All hose are 4" diameter. 4" Aluminum duct, 15' compressed. Throught the floor or wall. 4" dia. 6" length. 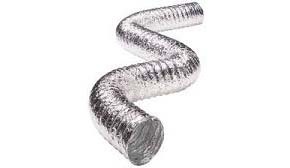 A clean dryer vent extends dryer life, lowers utility bills, and conserves energy. Designed with rounded brush ends for no snag cleaning. 4" brush with 20' handle. Round rubber jacketed wire, molded on plug. Black, 4-wire for mobile homes. 4', 30 AMP. 3 pole, 4-wire, 30-AMP, 125/250-volt dryer receptacle with "Quick-Lok" terminals. A high-quality finish, thanks to the patented Lock-On Trim Ring. Available with scalloped or square corner details. Patented exhaust flaps stay closed when not in use. Width: 7", Height: 8" (exterior surface, edge-to-edge) Venting Area: 12 sq. in. Locking position: .75", 1.00", 1.25". Available in square and scallop shapes. Subtle details elevate the concealed vent flap from functional to fashionable. Locking positions: .75", 1", 1.25" 12 sq. in. net free ventilation area. Includes 8" long aluminum tube (4" dia. ).